We will need to use programming code to create the dynamic list of posts. If you don't have any prior programming knowledge, don't worry; we will make it as simple and detailed as possible. 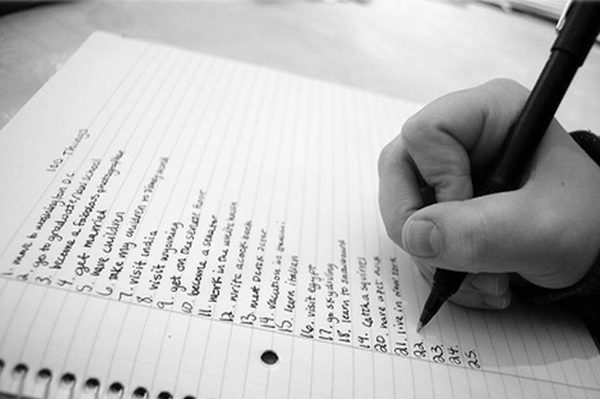 Did you have any trouble creating your list of posts? Since we are going to write code for our website, we will need access to our hosting servers, either through FTP or using the File Manager on Cpanel/Plesk. We will write the code locally on our PC, and then upload it to the proper folder for the WordPress installation to use it. We can use any text editor to create the dynamic list of posts, like the Windows Notepad. It's better, however, to have a code-aware editor, as it will color-code the various programming elements (comments, tags, etc.) and help us avoid mistakes. For this guide, we will use Notepad ++, one of the best-known text editors for programmers, with multiple features both for the novice and the experienced programmer. 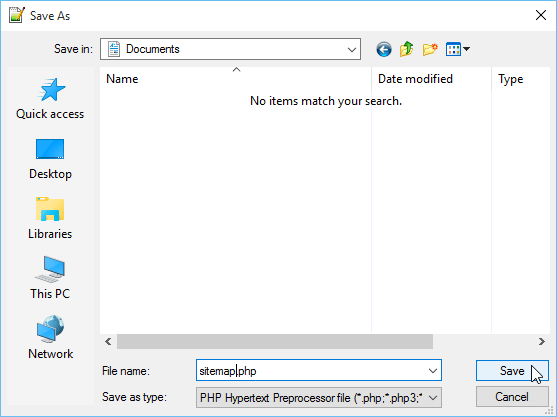 ...and select to save the file as PHP Hypertext Preprocessor file. This way, Notepad++ will know we are writing PHP code, and will apply the proper format. 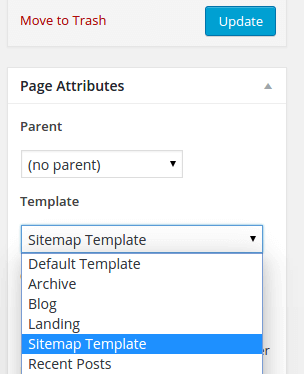 We will first create a page template on WordPress, which we can use to create any dynamic list of posts, e.g. a full archive, a site feed, a categories archive, etc. The first step is to declare that this is a page template and give it a name. You don't need to write this code; you will find it in full to copy and paste it below. As you can see, inside the <?php ... ?> we create comments between /* and */. Outside the PHP, the comments are between <!-- and -->. This is an important distinction. The name we have selected here is the one we will find at the page editor, on the "Template" list. Make sure it describes the type of page you want to create. 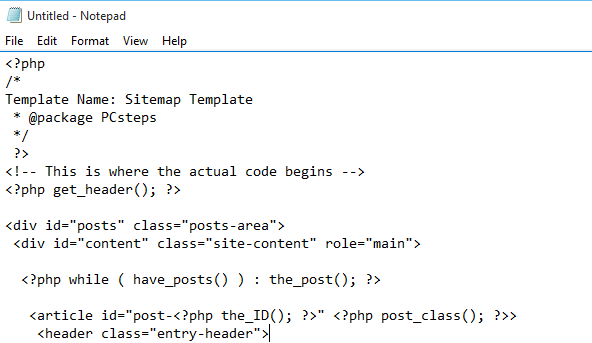 After the template name, we import the page header with the <?php get_header(); ?> code, and we open two <div> tags. It's optional to give them an id and class, but it will help if we want to use CSS to change the list of post's appearance. It's good coding etiquette to leave spaces or tabs before each new sub-tag. It makes the code easier to read and will help us make sure we have closed all the tags. The have_posts() function is boolean, and will return TRUE OR FALSE. The above code will check if there are posts left (have_posts() is true), and return each post. We also create a header, where we use the function the_title() to import the page title. We open two more <div> tags, one for the page content, and one for the list of posts. The "page-content" div will include any text we write on the page which will use the template. Inside the "posts" div, we will add the proper code, to create the list of posts we want. There are several different options at this point, so we will leave it blank for the time being, and we will list some examples later in the guide. Finally, we close all the tags we have opened: the posts and "page-content" divs, the article, the while, the "site-content" div and the "posts-area" div. After the main code, in the example we have hidden the sidebar. To have it appear, we uncomment the get_sidebar() function. The last function get_footer() will load the page footer. 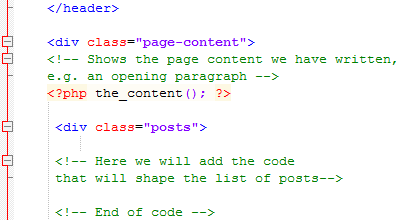 Depending on the type of list of posts we want to create, we need to add the specific code right after the <div class="posts">. We can add more than one code, to combine two types of functionalities. The Genesis Framework is one of the most popular theme frameworks for WordPress. Since the Genesis Framework works in a different way than most themes, the above code will not work to create a list of posts. This is the code that will work on the Genesis Framework and any child-theme. This code is much simpler since it doesn't require us to create div tags, the Genesis Framework takes care of it for us. 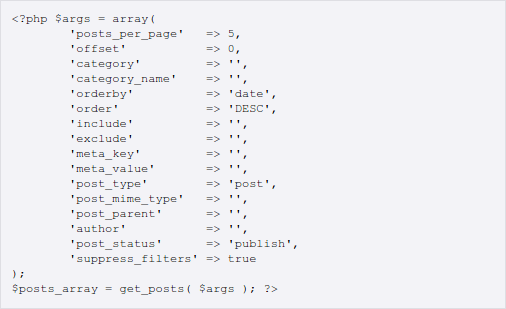 For more options for the $args array, which will allow us to include the proper posts on the list, and in the proper order, you can check out the WordPress Codex for the get_posts function. For both of the above scenarios - general theme and Genesis Framework - after we have created the file we just need to upload it, either by FTP or by the File Manager. 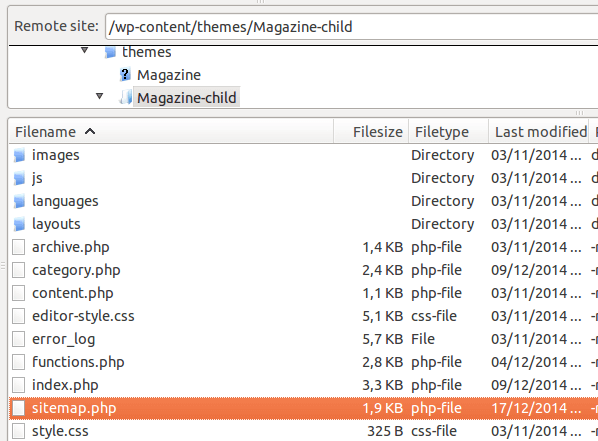 For the Genesis Framework, if we are using a child-theme, we need to upload the file to the child-theme's folder. After we have uploaded it, we create a new Page through WordPress and select the new template. 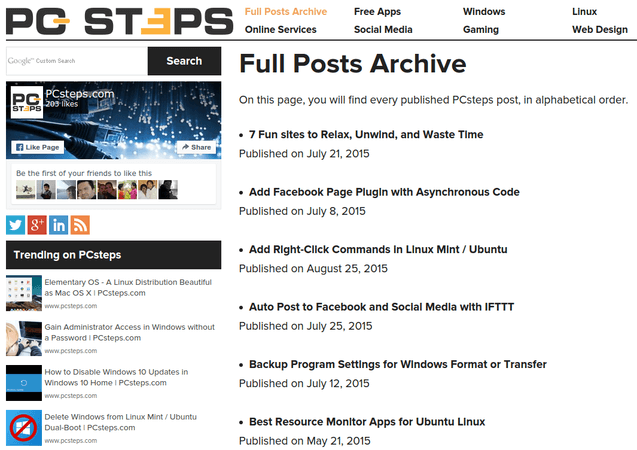 you will find all the published posts of PCsteps.com, in alphabetical order. If you can't get the list of posts to work on your theme, or it works, but it's not exactly how you like it, leave us a comment.